This evening downtown Hood River lost one of its few remaining wood frame buildings. The building which originally housed Claude Cuddeford's Blacksmith Shop (most recently the Kayak Shed) was consumed by a fire shortly after 8PM. The building was constructed between 1905 and 1909. Given that it served as a blacksmith shop or machine shop for most of its life, it's amazing it survived 110 years. While not a particularly showy building, it's always been one of my favorites, both for its rich history and working class bones. It spoke of a day when downtown Hood River was filled with shops which supported the valley's agriculture and logging industry. Claude Cuddeford was co-owner of the earliest blacksmith shop in Hood River, Cuddeford & Howell. The land for the shop was purchased from Henry C. Coe on April 18, 1882. Cuddeford originally owned the shop with Willis Snow before going into partnership with Arthur F. Howell sometime before 1908. The shop handled a majority of the blacksmithing in the Hood River Valley. 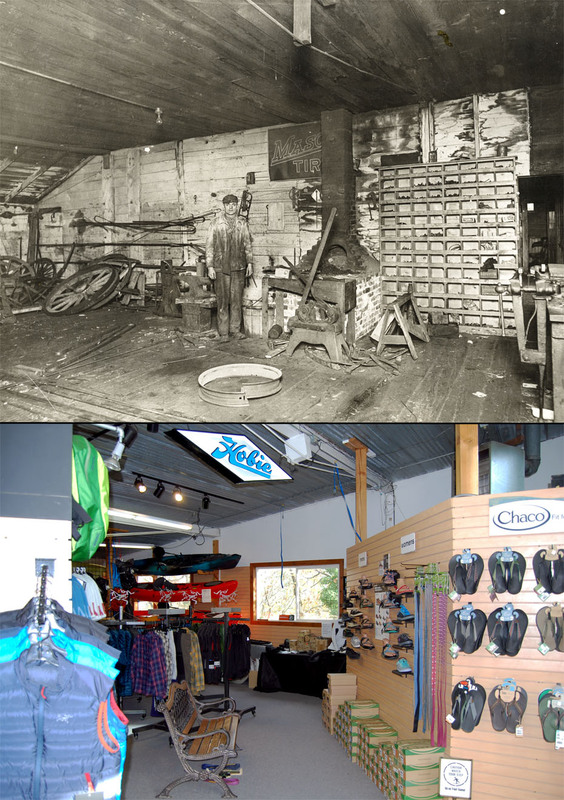 Around 1920, Cuddeford sold the shop to Hector Unger who changed the shop into a machine shop. The shop was eventually sold to John and Frances Schlosser. I’m sure most of you know the more recent history: Hurricane Sails, Cascade Outdoor Store, and finally, the Kayak Shed. Last November I visited the Kayak Shed to take some photos for my "Haunted" lecture at the "Rooted" series for Livable Hood River. The result is above. I spoke about all the long dead people I see every time I walk around Hood River. Claude Cuddeford was one of my favorites. I'll still see him every time I pass City Hall, where his name is engraved on a plaque as a city councilman when the building was constructed. But I suspect this is where he really felt at home, and that home is gone. So sorry for Hood River's loss. From the appearance of Cuddeford's shop, it is amazing it survived to become a part of the new HR scene....water sports. Getting up this morning and reading about Hood River's fire last night, reminded me of an earlier HHR night time fire photo, in the same area, at the Fashion Garage. When I was quite small it was Huott's machine shop, then it was Engle and DeHart. As old as the innards were wouldn't you think that some of those boards had sopped up a lot of oil and grease over the years, which only added fuel to fire. Sad to see part of H.R. history burn, but at the same time only applause for the firemen who made certain the surrounding buildings were saved. Thankfully there are photos remaining so one can keep in mind what things were. I remember when it was Schlosser's. Thanks to Arthur and HHR for making this building, and Claude Cuddeford, familiar to us, before it was gone. Don't remember it as Engle and Dehart, it went from Huotts to Schlosser's, Schlossers did buy the Engle and Dehart's Building on Tucker road. Sad to see such an old building destroyed. In the 1940's, I lived right next door to Huott's Machine Shop. Y'all are confusing me somewhat. The Engle and DeHart shop was on Columbia Street. Their shop was Howell Bros., Then Howell & Engle, then Engle & Bentley, then Engle and DeHart. Engle and DeHart built a new shop on Tucker Rd. Larry Dinsmore owned the shop after Engle retired; Roy DeHart worked there for Larry Dinsmoore. After Larry it was run by Ladd Henderson, after which it was bought by Schlosser Machine and Welding which is there now. The Cuddeford smithy was used by Hector Unger when I first knew of it. From Unger it went to Huotte, then to Schlosser's. Schlossers bought and moved into the shop that Engle & DeHart built. That's the best I can sort it out. There could have been a couple other entities in there which I don't remember.